We just announced in a press release our partnership with the new play4REAL Lab at Yale’s Center for Health & Learning Games to create smokeSCREEN VR, a serious game prototype to be used as part of a larger research study funded by Oculus. The gameplay will rely on behavior change theory and virtual reality to immerse teens in peer pressure scenarios related to e-cigarettes, and to educate them on how to best respond. Andrew Schartmann, an affiliate faculty member at Yale’s Center for Collaborative Arts and Media and PhD candidate in music theory, will join the project to play up the intensity. Using dynamic music and sound effects, Schartmann will compose an audio environment key to achieving the desired emotional response. In addition, the prototype will have features allowing ‘mixed reality capture’ of the VR experience. By using a green screen we will be able to film people playing the prototype using the Stereolabs ZED camera while replacing the green background with the virtual environment. This will allow us to document and share the steps taken as we iterate on the prototype. Ultimately, the final goal is to create a vertical slice prototype to be published on the Oculus Store. Trying out the new green screen at Yale’s Play4REAL Lab. 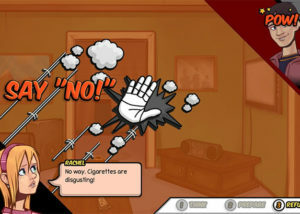 The play4REAL Lab will draw on research from their existing smokeSCREEN mobile app, as well as results from focus groups they are currently conducting, to create a “game playbook” which will outline the theory-based components that will contribute to heath behavior change, and the resulting requirements these impose on the game design. Next, PreviewLabs and the play4REAL Lab will brainstorm together on ideas for the game, while adhering to the requirements from the game playbook. The results will be captured in a report, allowing us to efficiently review them and decide on a feature set for the first prototype. Based on this feature set, Kasper will put together a Prototype Design Document (PDD) which we will update throughout the lifecycle of the prototype, ensuring both teams are on the same page before the start of each iteration. Here’s a peek at he current 2D smokeSCREEN mobile app. The goal for the first iteration will be to test the core game mechanics, and whether we are able to reproduce a peer pressure environment. We’ll examine it together with the play4REAL Lab to see whether this initial prototype met our expectations, what could be improved, and what would be the logical next steps. The second iteration of the prototype will focus on resolving eventual gameplay issues detected in the first iteration, while making it ready for the play4REAL Lab to take to focus groups with teens for feedback and input for improvement. In subsequent iterations, we will refine the gameplay based on testing results, including teen focus groups in the play4REAL Lab. Once we have the final prototype ready, Yale will conduct a pilot study with teens to collect data on the preliminary impact of the smokeSCREEN VR intervention using standardized measures. 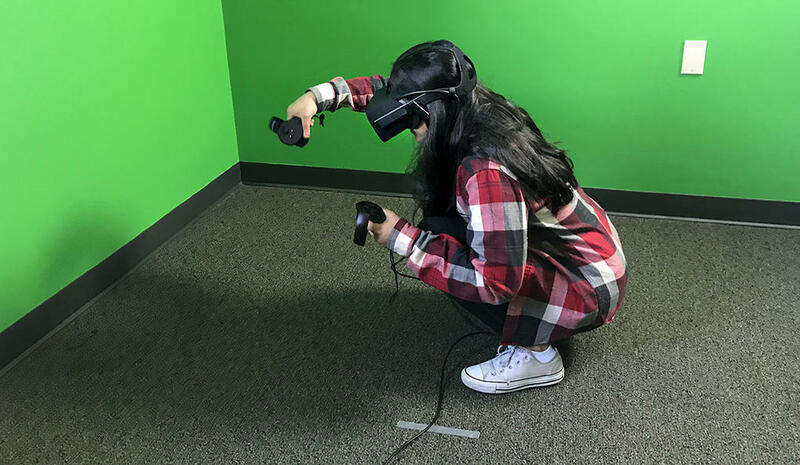 The play4REAL team will also collect feasibility on the implementation of the research study, including teens’ experience with playing the serious game, as well as conduct a smaller exploratory study on teens’ experience of social pressure in VR. We’re very excited to work on this project with Yale’s play4REAL Lab researchers. We’ll post updates on the blog when we have them. In the meantime, you can check out these 7 health research game prototype projects.